"Be sure to use red tart pie cherries, not cherry pie filling." In a medium saucepan combine 3/4 cup sugar, tapioca, cornstarch, and salt. Mix well, then stir in reserved cherry and strawberry liquids. Stirring constantly, cook mixture over medium heat 5 to 10 minutes or until it begins to thicken. Remove from heat; stir in cherries, strawberries, and lemon juice. Spoon fruit filling into pastry-lined pan. Top with second pastry. Seal and flute edges, then make steam vents in top crust. Sprinkle with 2 teaspoons sugar. Cover edges of pastry with aluminum foil to prevent excessive browning. Bake in preheated oven for 30 to 35 minutes or until golden brown. Remove foil during last 15 minutes of baking to allow pastry edges to brown. This pie was great! I made it for a pie auction and it sold for $100.00! I also of coarse had to make one for myself too! YUMMY! My whole family went nuts over it! Thank-you for the recipe! 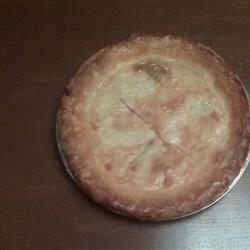 Great Pie, thanks for sharing, I have made this several times, I even have taken it to the Pie Social in the village on Band Concert Night. I made this recipe with frozen home-grown strawberries and cherries; it was great! Wait until it is cooled to eat or else it will be runny. Excellent recipe! Only change was to use egg wash on top.